Dimensions: 5.5"x 3.5" (0.23" thick) Due to the nature of the material, the card is a little bit smaller than the regular-sized card. Custom made in the USA. Quantity: 1 greeting card and matching envelope. NOTE: This is a real wood card. Therefore, the wood grains can vary slightly, making each card unique. Best Valentine's Day Gift! 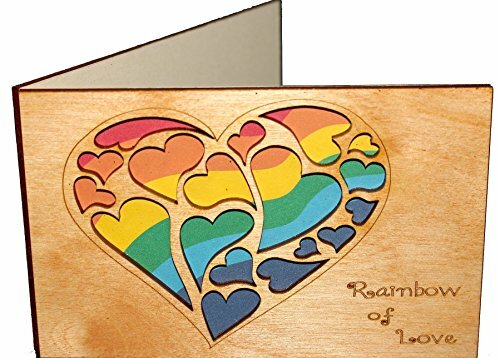 Also great for any occasion: Wedding / Dating Anniversary (especially for 5 th - Wooden), Your Loved One's Birthday Celebration; as Miss You / Thinking of You Card. NO-RISK PURCHASE! If you're not happy, we're not happy. That's where our "Love It or Send It Back" policy comes in. Dimensions: 5.5"x 3.5" (0.23" thick) Due to the nature of the material, the card is a little bit smaller than the regular-sized card. Custom made in the USA. Quantity: 1 greeting card and matching envelope. NOTE: This is a real wood card. Therefore, the wood grains can vary slightly, making each card unique. Perfect for any occasion: Wedding / Dating Anniversary (especially for 5th - Wooden), Your Loved One's Birthday Celebration; as Miss You / Thinking of You Card. Show your partner some love with this original Gay / Lesbian Valentine's Day card for the most romantic holiday of the year. NO-RISK PURCHASE! If you're not happy, we're not happy. That's where our "Love It or Send It Back" policy comes in. If you have any questions about this product by LapaTOON, contact us by completing and submitting the form below. If you are looking for a specif part number, please include it with your message.